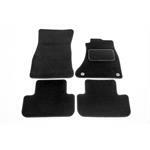 Car Mats - Premium Quality Carpet mat Universal standard fit. At AutoFastFit we carry a large range of universal and tailored mats to suit the most popular vehicles on the road. Most of our Mats are made locally and are of high quality. If you don't see your require set of mats here please get in touch and we'll have them made for you. We can also make Rubber Boot Mats for any car and commercial.